EXTREME Whitetails is for sale!!! A first class-controlled whitetail hunting property with lodging, superior whitetail genetics, breeding facilities, 17,902 linear ft of 8 high fence. 12,100 linear ft of 8 high fence breeding pens, shooting houses, equipment and CRP income of $34,2240.00 per year through 9-30-2020. The lodging consists of a 2,174 sq. ft. farm residence with porches, carport & other amenities, a bunkhouse with 1,840 sq. ft. of living area with covered patio & porches, and a deer breeding facility, complete with shop area, breeding rooms, and luxurious rustic living quarters and entertainment area. Whitetail genetics include a 14-year breeding program that has produced some 250 to 350 whitetail deer. The entire deer herd has been DNA tested. 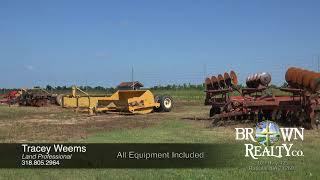 Equipment includes several tractors and multiple implements necessary for maintenance of the property, (see complete list of equipment.) Other mentionable items include storage sheds, holding pens, shooting houses, irrigation wells and more. This property provides exceptional recreational potential such as quality deer, duck and dove hunting. Income potential comes at owners discretion from trophy whitetail hunting, memberships, shares, CRP, corporate gatherings, whitetail bloodlines etc. Adjoining landowner will consider leasing an additional 900 +/- acres of wildlife habitat for recreational use with exceptional duck, dove & deer hunting. Extreme Whitetails provides the owner all this and more. If you are looking for your own private family retreat or an income producing corporate entertainment facility, this is a must-see property.